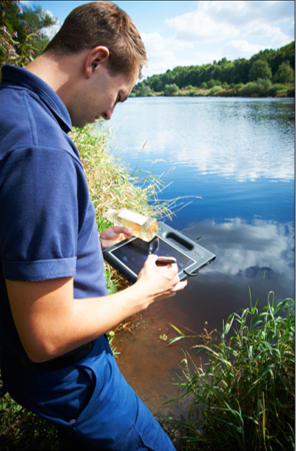 CSols have developed the Remote Sampler ruggedized handheld Windows tablet PC solution for external remote sampling and sample collection. CSols Remote Sampler solution consists of ruggedized handheld tablet PCs (usually one per sampler). The system also utilizes a hub workstation based in the laboratory which can also be deployed over Citrix. The hardware is then combined with software and utilities to help users integrate the system easily into their organization’s routine operations. 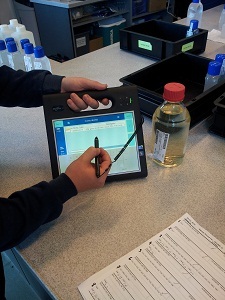 PDAs/Tablet PCs from Gotive, Motion Computing and Panasonic have been successfully deployed. A workstation normally located in the laboratory or sample storage location running the CSols Hub software provides the interface between the handheld devices and the laboratory LIMS or IT system. Planned or ad hoc collection runs and associated instructions are extracted and downloaded and later uploaded to all active handheld devices. Design of the software on both the handheld and hub systems has then been done in combination with a number of end users to maximize usability and to meet their technical requirements. Here a few of the key capabilities of Remote Sampler system are described in more detail. When bottles, tubes or plates are used to collect samples it is important to ensure the unique identifier on the container is correctly matched to each sample and that the time and position of the sampling is taken. The Remote Sampler software uses the built in barcode reader and GPS co-ordinates to capture this data. In the event that the sampler needs to record additional parameters or carry out tests while on site, the Remote Sampler software first prompts the sampler, then guides them, via a wizard, through the process to ensure all of the correct information is captured. • helping the sampler to find the sample location. Especially useful for emergency, ad hoc sampling or rarely sampled locations. CSols Remote Sampler solution is a powerful and flexible system to support the collection and recording of external samples of all types. Please click here to download the case study. For a copy of the Remote Sampler Technical article, further information or a demonstration of Remote Sampler please ask via our enquiry page or email us at: remotesampler@csols.com. Analytica app – Ready for download!